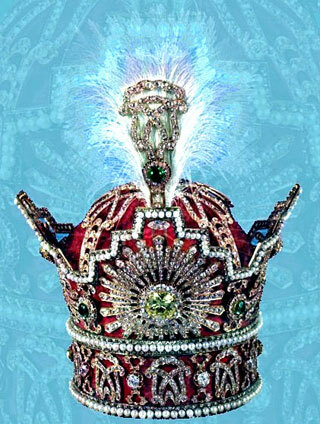 The Imperial crown jewels of Iran (also known as the Imperial crown jewels of Persia) include elaborate crowns, thirty tiaras, and numerous aigrettes, a dozen bejeweled swords and shields, a number of unset precious gems, numerous plates and other dining services cast in precious metals and encrusted with gems, and several other more unusual items (such as a large golden globe with the oceans made of emeralds) collected by the Iranian monarchy from the 16th century (Safavid dynasty) on. The collection is housed at The Treasury of National Jewels (the official name) but is known colloquially as the Jewellery Museum. This article uses material from the Wikipedia article "Iranian Crown Jewels", which is released under the Creative Commons Attribution-Share-Alike 3.0 License.